A concise history of the origins of the “war to end all wars”. Many of us know that the first world war began when Archduke Franz Ferdinand of Austria and his wife were assassinated in Sarajevo in June of 1914. But have you ever wondered exactly what chain of events led up to the incident that caused the whole world to erupt into one of the bloodiest conflicts in our history? Expert military historian and lecturer John Lee explains the causes behind the origins of the war and gives us a unique insight into the unfolding drama that defined and shaped a generation – and generations to come. 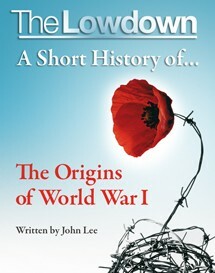 John Lee is an Honorary Research Associate of the Centre for First World War Studies, University of Birmingham, and a member of the British Commission for Military History, the Western Front Association, the Gallipoli Association, the Army Records Society, the Douglas Haig Fellowship, the Biographer’s Club and The Churchill Centre. He has had three books and twelve chapters of military history published, along with two books written jointly with his wife, Celia. Two more books are currently under contract. He conducts four battlefield tours a year and delivers public lectures about ten times a year. He worked in bookselling and publishing for forty years and is now ‘retired’. He lives in London and Northern Ireland.